Here is a quick solution for displaying menu items in your mobile menu and not in your regular desktop menu. 1. We’ll be using the lightweight and simple plugin: Menu Items Visibility Control. Download from the link or go to PluginsAdd New and search for Menu Items Visibility Control. Install and activate. 2. Go AppearanceMenus and select the menu you’d like to edit. This plugin has lots of possibilities. 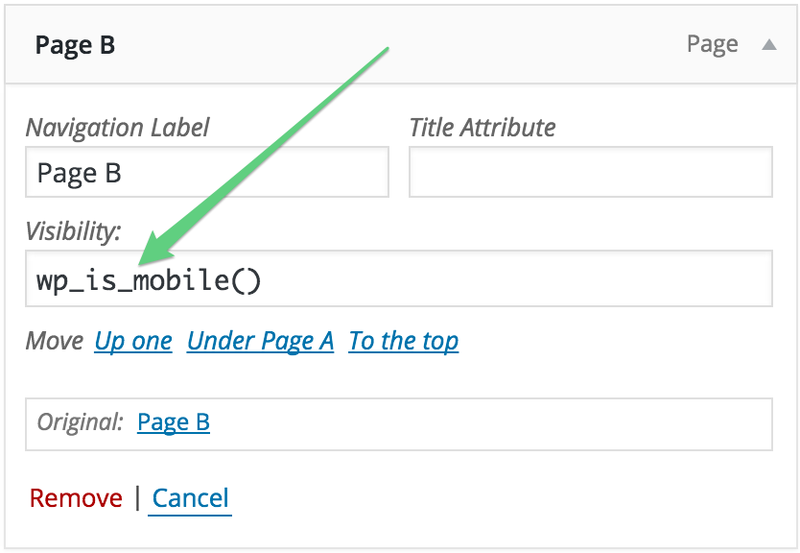 In this tutorial, we’re just going to look at displaying a menu item for our mobile device users only. That’s it! The menu item will now only appear for mobile users. Keep in mind that the conditional statement used is device dependent. Re-sizing your browser on a desktop won’t reveal the menu item, you’ll need to test on your mobile device.